Recommended Use: Flexible and Rigid Epoxy Filler for plastic. May be harmful if swallowed. Causes skin irritation. Causes eye irritation. Keep out of reach of children. Read label before use. Do not get in eyes, on skin, or on clothing. Eye Contact: Skin: Slightly irritating. Prolonged exposure may cause allergic reaction in susceptible individuals. Eye: Mildly irritating. Skin Absorption: Redness, allergy reaction, eczema, or skin conditions. Inhalation: May result in irritation of nose, throat, and respiratory tract. Ingestion: Slightly toxic. May cause irritation of throat, mouth, and gastrointestinal irritation. Eye Contact: Rinse opened eye for several minutes under running water. If symptoms persist, consult a doctor. Skin Contact: Wash with soap and water and rinse thoroughly. Medical Conditions Aggravated by Exposure: Respiratory tract, skin and gastrointestinal irritation. Steps to be Taken if Material is Released or Spilled: Soak up with absorbent material and place in ventilated waste container for disposal. General Handling: Keep out of reach of children. Keep tightly closed. Eating, drinking, and smoking should be prohibited where there is potential exposure to toxic material. For professional use only. Not intended for sale to the general public. Storage: Store in a cool, dry, well ventilated place. Keep tightly closedto prevent leakage and retain activity. Store away from open flames. Prevent skin and eye contact with appropriate clothing and safety glasses. Avoid inhalation of dust generated during machining after cure. Eye/Face Protection: Safety glasses with side shields. Skin Protection: Rubber or plastic. Respiratory Protection: When used in confined area, an approved chemical/mechanical filter, designed to remove a combination of particles and vapors,should be used. Hygenic Measures: Wash hands before eating, smoking, or using the washroom. Other Protection Measures: Wear impervious clothing and boots. Eye wash stations and safety showers should be available. Engineering Controls: Provide sufficient mechanical, general, or local exhaust. Incompatible Materials: Strong oxidizing agents, epoxy resins and amines. Dispose of in an approved chemical waste landfill or incinerate in accordance with applicable federal, state and local regulations. Do not contaminate lakes, streams, or other water supplies. Mercaptan-terminated polymer is listed with New Jersey Right to Know. 2,4,6 Tri(dimethylaminomethyl) Phenol is known to the State of California to cause cancer. 2,4,6 Tri(dimethylaminomethyl) Phenol is listed with Comprehensive Environmental Response, Compensation, and Liability Act (CERCLA). Talc is listed with Pennsylvania Right to Know. Talc is listed with Rhode Island Right to Know. Talc is listed with Illinois toxic substances discloure to employee act. Talc is listed with Minnesota Right to Know. Titanium Dioxide is listed with Pennsylvania Right to Know. Titanium Dioxide is listed with Massachusetts Right to Know. Titanium Dioxide is listed with Rhode Island Right to Know. Titanium Dioxide is listed with Illinois toxic substances discloure to employee act. Titanium Dioxide is listed with New Jersey Right to Know. Titanium Dioxide is listed with Minnesota Right to Know. Titanium Dioxide is listed with the Occupational Safety and Health Administration (OSHA) as a possible carcinogen. Cellulose Fiber is listed with Pennsylvania Right to Know. DiVinyl Benzene is listed with Pennsylvania Right to Know. DiVinyl Benzene is listed with Massachusetts Right to Know. Recommended Use: Flexible and Rigid Epoxy Fillerfor plastic. Eye Contact: Skin: Slightly irritating. Prolonged exposure may cause allergic skin reaction in susceptible individuals. Skin Absorption: Redness, allergy reaction, eczema or skin conditions. Ingestion: Slightly toxic, may cause irritation of throat, mouth and gastrointestinal irritation. Medical Conditions Aggravated by Exposure: Respiratory tract, skin, and gastrointestinal irritation. Unusual Fire and Explosion Hazards: Combustion and combustion products may be toxic. General Handling: Keep out of reach of children. Keep tightly closed. Eating, drinking and smoking should be prohibited where there is potential exposure to toxic material. Storage: Store in a cool, dry, well ventilated place. Keep tightly closedto prevent leakage and retain activity. Store away from open flames. Prevent skin and eye contact with appropriate clothing and safety glasses. Respiratory Protection: When used in a confined area, an approved chemical/mechanical filter, designed to remove a combination of particles and vapors,should be used. Hygenic Measures: Wash hands before eating, smoking, or using the wash room. Engineering Controls: Provide sufficient mechanical, general, or local exhaust ventilation. Incompatible Materials: Strong oxidizing agents, mercaptans, strong acids, bases and amines. 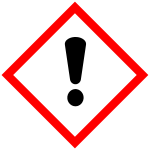 Hazardous Decomposition Products: CO, CO2, H2S, HCl, and oxides of nitrogen. Dispose of in accordance to applicable federal, state and local regulations. Do not contaminate lakes, streams, or other water supplies. Aliphatic petroleum Naphthas is listed with New Jersey Right to Know. Epoxy Resin is listed with Pennsylvania Right to Know. Epoxy Resin is listed with New Jersey Right to Know.